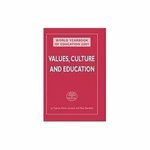 "World Yearbook of Education 2001: Values, Culture and Education" by Jo Cairns, Denis Lawton et al. Susan D. Franzosa is a contributing author, "Culture and Schooling in the United States of America", p. 298-316. This yearbook on education for 2001 brings together leading international voices on values in education and presents a window on current debates. These include such fundamental issues as who should decide upon the values we adopt. –Publisher description. Franzosa, Susan Douglas. "Culture and Schooling in the United States of America,"World Yearbook of Education 2001: Values, Culture and Education , Ed. Jo Cairns, Denis Lawton and Roy Gardner, London: Kogan Page Ltd, 2001, 298-316. Cairns, Jo; Lawton, Denis; Gardner, Roy; and Franzosa, Susan D., "World Yearbook of Education 2001: Values, Culture and Education" (2001). GSEAP Faculty Book and Media Gallery. 6.